There are times when adding a new chunk of knowledge, another easy five-step “how-to” transform the conundrum de jour, a new fix or patch that almost works but just doesn’t open the options you’re looking for. And there are times — and you can recognize them by the inability to find a solution that lands with a sense of ease — when we don’t need more. We need less. Sometimes, we don’t need to learn something new, but rather unlearn something old. Unlearning is the ability to recognize and take apart a groove-worn habit, comfortable mental construct, long-held belief or increasingly wobbly emotional preference. It is the process of recognizing that something in our lives lacks ease; that something we've learned, and learned well, is no longer of use. It has served its purpose, but now must be taken apart so something brilliantly relevant and supportive can take its place. Prometheus stole fire from the gods for the benefit of humankind. If I could steal something of value from the realm of the divine it would be the secret to unlearning. This is not something that you'll find as an online course on the Internet. It's rarely taught in schools. It goes against the orthodoxy of our consumer culture with its breathless insistence of acquiring more, more and more. Take a moment, a quiet moment, and consider not what you need to learn or acquire, but what needs to be dismantled and unlearned. It could be aversions that get in the way of more deeply connecting with others. Or a blast of blame that gives you a dose of righteous indignation. Or the recognition you’ve propped yourself up with acidic energy of resentment and frustration. Unlearning is a kind of surrender, an invitation to breathe in a moment of grace, release and renewal; and breathe out a world of possibility. Spring’s astonishing floral fireworks of bursting buds and lingering fragrance can’t come too soon after the drudgery of the light struggling out of winter’s dark grasp. Life again springs forth with its fragrant pollination. It’s glorious! Of course, if you have allergies, it is especially hard to miss the symphonic crescendo of this season. There are a number of acupuncture points that can help curtail sneezing, congestion and the stuffy head that goes with Spring’s florid exhale. These points are on the Large Intestine channel, which runs from the index finger to the elbow and then up to the nose and frontal sinuses where it connects with the Stomach channel that runs up into the forehead. Manipulation of these points helps with the misery that accompanies congestion, sinus pressure, headache and distention that Spring allergies bring. Additionally, these points have an effect on the large intestine itself. Why is this important? Because the beneficial bacteria in our gut help to modulate immune response and levels of inflammation. So working these points both helps our gut health and treats issues along the trajectory of the channel. 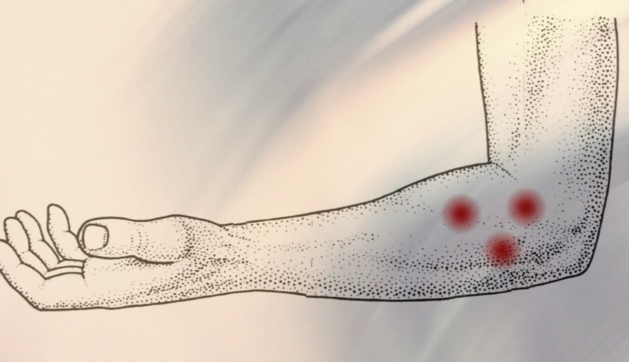 There are a number of points that are close to each other, but for your own DIY acupressure treatments you just need to be concerned about the general area on the outside of the elbow, as you see in the illustration. The trick is to find the areas that are tender or sore to the touch, and give them a gentle but firm massage for 3-5 minutes several times a day. You can do this while watching TV, waiting in the line at the grocery or even while reading a book. The easiest way is to bend your thumb at a right angle, and use it to dig into the tender spots. Bending the thumb this way allows you to really get into those points without putting undue pressure the thumb joint. Another good option for doing some acupressure is to use a Sharpie magic marker. It’s just the right size and the end opposite the cap is shaped perfectly to get into those tender spots. Don’t be surprised if these points are tender, especially if you have issues with allergies. And remember — some acupuncture treatments at the turn of seasons can help your body adjust. We also have some herbs that can help ward off the effects of nature’s pollenated explosion. If you think you need some help with allergies, then you probably do. Call the clinic or visit us online to make an appointment to tame those allergies. Avoiding media mentions of the anti-inflammatory effects of turmeric is like trying to avoid the brouhaha of the presidential election-year reality TV show. Articles about the amazing orange stuff are everywhere. In the past few years many a study has shown that turmeric can not only be used to add some pungent spice to your homemade curry, but it helps to ease joint pain, reduce systemic inflammation and even kill cancer. Turmeric, known in the Chinese medicine pharmacopeia as Jiang Huang, has long been used by the Chinese to improve the quality and flow of the blood, reduce pain and improve digestion. Modern research shows that cucurmin is the active ingredient in turmeric that is responsible for its healing properties. 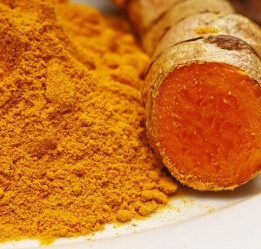 The problem with turmeric is that it is not particularly bio-available, meaning that eating it by itself does not unleash its full healing potential. So if you want to use turmeric in a medicinal way, you need to catalyze it by adding a bit of pepper. Common black pepper, which contains piperine, will do the trick. Pepper dramatically increases the pain-relieving and anti-inflammatory properties of this delightfully bright golden botanical. Additionally, when digested in the presence of oil, the healing properties of turmeric are enhanced. If you are looking to take a turmeric supplement, then be sure it has pepper in it as well. Or you could do as they have been doing in Asia for millennia: eat curry on a regular basis. Traditional curry recipes contain this anti-inflammatory triumvirate of turmeric, pepper and oil. You can use this combination in everything from soups to stews, in stir-fries or in sautéed tofu or in your morning eggs. Or whirl some fresh turmeric with a dash of pepper and dollop of coconut oil into your morning smoothie. Share it with me and I’ll post it in the clinic newsletter. There is a free acupuncture treatment in store for the person whose recipe gets selected. So, spice it up and send in your favorite curry recipe! for the mistake that becomes knowing, for knowing that becomes wonder, for wonder that makes everything porous, allowing in and out all available light.An impermeable life is full to the edges, but only to the edges. Like the pause at the center of the breath, neither releasing or inviting, with no hollow spaces for longing and possibility.I would rather live unlocked, and more often than not astonished, which is possible if I am willing surrender what I already think I know. • What is the body, in its perfect wisdom, asking for?